We’d love your help. Let us know what’s wrong with this preview of Toddler 411 by Ari Brown. The truth about The Terrible Twos and how to raise a well-behaved child without going insane. Picky Eaters learn how to cope . . . and convince your child to eat something besides Goldfish crackers. Toilet train your toddler in just one day. No, that s not a typo learn the Zen of Toilet Training, when to start and how to make it work. What s normal and what s not when it comes to your toddler s growth and development. Spot the early clues for autism and other red flags. Simple steps and smart advice to avoid environmental hazards. The most up-to-date, evidence-based health info for you and your toddler! 1. Cow's milk and dairy alternatives Safety, health and nutritional needs. 2. Picky Eater Primer More tricks and tips for dealing with picky eaters! 3. Food allergies on the rise. A special section on food allergies and gluten sensitivities. 4. Preschools: When to go, why to go! To ask other readers questions about Toddler 411, please sign up. Ok. Some stuff was helpful, other stuff was the kind of stuff that can make you crazy. Sassy Summary: This no-nonsense reference guide aims to save its reader a trip to the doctor’s office by providing easy-to-find answers to common questions (How Often Should My Child Pee?) to advice on handling Picky Eaters. Success! The index and glossary are comprehensive. It’s funny. It’s smart. It’s reassuring. My only complaint is that the organic food recommendations gave me anxiety and made me afraid to put anything in my child’s mouth. Quotable Writing: Follow the “Two Stop” Rule. Gettin Sassy Summary: This no-nonsense reference guide aims to save its reader a trip to the doctor’s office by providing easy-to-find answers to common questions (How Often Should My Child Pee?) to advice on handling Picky Eaters. Success! The index and glossary are comprehensive. It’s funny. It’s smart. It’s reassuring. My only complaint is that the organic food recommendations gave me anxiety and made me afraid to put anything in my child’s mouth. Quotable Writing: Follow the “Two Stop” Rule. Getting in and out of your car with a toddler is an experience itself. With our kids, we always had a two stop rule for Saturday errands–that is, if you have to stop the car more than twice to do errands, you are asking for trouble. Cheetah or Snail? Cheetah. I skimmed this book in one evening. Buy or Borrow? Buy. Give it as a gift to a mother on her child’s first birthday. Book Club Discussion Generator? Nah. Who should read it? Any caregiver for a child between the ages of 1 and 4 years old. Great reference book. I stumbled upon it at the Library, but now want it for my own book shelf. The concluding chapters on illness and First Aid are something I would like to have at my fingertips when needed. Many authors of mom-help books try to use humor -- and completely fail. Fields might just be the first one I've seen succeed. Her humor comes at just the right time, and it isn't forced. If I go through the baby stage again, I'll have a copy of Baby 411 on hand. I'm sure it is just as fabul Great reference book. I stumbled upon it at the Library, but now want it for my own book shelf. The concluding chapters on illness and First Aid are something I would like to have at my fingertips when needed. If I go through the baby stage again, I'll have a copy of Baby 411 on hand. I'm sure it is just as fabulous a read. I'd say Toddler 411 is to Toddler Parenting as Mayo Clinic Guide to Healthy Pregnancy is to Pregnancy. Namely, a must read. This book provides a comprehensive overview of what parents can expect in the toddler years. Mostly a reference tool for quick answers, I'll likely start here, and then read more in depth from my other parenting books that delve into the various subject matter more deeply. My favorite parts were the developmental milestones and when to take your child to the ER versus to the doctor versus the need for no medical visit at all. This approach is taken in different ways in regard to various topics, This book provides a comprehensive overview of what parents can expect in the toddler years. Mostly a reference tool for quick answers, I'll likely start here, and then read more in depth from my other parenting books that delve into the various subject matter more deeply. My favorite parts were the developmental milestones and when to take your child to the ER versus to the doctor versus the need for no medical visit at all. This approach is taken in different ways in regard to various topics, which I thought was great. It was all about "should I panic?" and if so, "how much?". My two year old was an embarrassment today. This book is calming, positive and concise. One uplifting part of reading parenting books is knowing that you don't have ALL the problems addressed, just some of them. And, furthermore, you are mostly doing it just fine. This series is a mother's refuge and tolerably short enough for father's to read the sections mothers have tabbed. Gift it. They will thank you. I've been reading a lot of toddler books lately, and this is one of the best. I love the easy to follow format, and I love the emphasis on practical solutions that are child-centered. I really like how encompasses so many aspects of toddlerhood in one easy reference versus one book for discipline and one for nutrition etc. Out of the numerous books out there, I've loved the 411 series for babies and toddlers. Packed full of great information. This book is as much as primer for dealing with the toddler years as it is a reference. Well written, easy to digest, interesting and most importantly helpful. Not as good as Baby 411. Focuses far more on diseases, injuries, etc. so will likely come in handy as an encyclopedia. Didn't like the recommended approaches to discipline and would recommend the Janet Lansbury books for that instead. It's a little dated. I'm curious as to whether there's a new edition out. Otherwise, this book is great! Covers everything from development to potty training to first aid and illnesses to nutrition and everything in between. Definitely helpful for a new mom of a toddler! I highly recommend especially if you're curious or concerned about what to expect in toddlerhood. Great reference, just like Baby 411! There's a lot of duplicate info between the books where it's relevant to both infants and toddlers, but this book also covers a lot of toddler-specific topics. I haven't read the entire thing since I have less time to read now, but it's easy to skip straight to the parts I need when I have questions. I picked up Toddler 411 because I enjoyed the authors' Baby Bargains book so much. The authors have a matter-of-fact style to parenting and I appreciate their non-judgmental approach to controversial topics. Overall, Toddler 411 was much of what I expected from them. The book is an encyclopedia of toddler. It covers everything you could imagine: milestones, weird but normal behaviors, potty training, transitioning to a big kid bed, and a whole chapter on poop (if you have a toddler then you know I picked up Toddler 411 because I enjoyed the authors' Baby Bargains book so much. The authors have a matter-of-fact style to parenting and I appreciate their non-judgmental approach to controversial topics. Overall, Toddler 411 was much of what I expected from them. The book is an encyclopedia of toddler. It covers everything you could imagine: milestones, weird but normal behaviors, potty training, transitioning to a big kid bed, and a whole chapter on poop (if you have a toddler then you know just how essential this chapter is). The second half of the book is called "Toddler Healthwatch" and covers minor bumps and bruises all the way through to red flags for meningitis. The authors stand so strongly by their product that the end of the book contains the guarantee that if the book hasn't saved you one co-pay for a doctor's visit, they will refund your money entirely. The thing I most appreciate about the "411" series is that everything is backed by evidence. There are no broad generalizations about what is "best" for a child, and any time the authors make a recommendation they explain the reasoning and cite medical research on the topic. A great example of this was their handling of vaccines. There has been so much hype about the vaccines and the unknown damage they may or may not be causing, and it can be very alarming to a parent trying to make an informed decision. The authors first explain how we came to using vaccines, and describe the climate pre-vaccine (pretty scary for a child). They hypothesize that vaccines are a victim of their own success; vaccines have been so successful at eradicating disease that we wonder if we need them at all. This is followed up by a top ten FAQ that I'm pretty sure they lifted directly from a transcript of one of my son's well-child visits. (I think our pediatrician would have appreciated me reading this book first, THEN playing 20 questions with him.) The most valuable thing I took from the vaccine chapter was this: mercury preservatives were removed from all vaccines in 2001. Why is no one talking about this when talking about vaccines? "My child chronically throws up only in the morning. Should he see the doctor?" Read by ACRL Member of the Week Christina Chan-Park. Learn more about Christina on the ACRL Insider Blog. Hands down, this book combined with Toddler 411 are the parenting books I would own if I could only have two. They have absolutely everything you need for your child up to about kindergarten in 2 concise volumes that are easy to read, entertaining (you'll laugh out loud) and most importantly, are conveniently organized as a reference tool. The overall tone of these two books is that of a "Hey, you'll be okay Grasshopper." one that is comforting and reassuring. I picked this up in the new book section at the library, and since I have a very rambunctious 17 month old, I needed some help. I had questions about illness, bodily functions, behavior problems, and eating habits. Honestly, I just wanted to makes sure the way he was acting was normal, as he is my first child and I'm still pretty new at this parenting gig. This book answered my questions and assuaged my fears. I recommend it to parents, 4 stars. When waiting for baby #2, I outsourced this reading to my husband to better understand our toddler. He really enjoyed the scope of this, but I still had to borrow it 100 times from the library only to give it a glancing read. My main concerns - potty training, tantrums, overall discipline, food allergy management, eczema - were covered but not as deeply as I felt I needed for this moment in time. This is a wonderful, solid book an the medical side of raising a toddler. It covers everything from first aid to nutrition guidelines to constipation. It teaches you the signs you need to look for in oder to know whether to wait a medical issue out or seek immediate attention. My favorite sections were on potty training & vaccinations. Everything was clear and easy to understand and told in a way that doesn't scare the reader. This book is a killer! I have already laughed about things my kid is already doing. It gives me great reassurance too that even though Chance despises milk I can keep feeding him cheese, yogurt & even ice cream to counter the balance without feeling bad. Proving to be a must have on my home reference shelf!!! My boyfriend Logan is turning three, and has been having lots of temper tantrums lately, so I wanted to see if the experts could recommend any strategies for coping. It turns out I am already helping him the way the author suggests, guess all that child-rearing experience is coming in handy, but it was nice to know that I'm on the right track. This book was somewhat helpful and slightly humorous. But at least the second half was about scary problems or diseases your kid could develop- and seeing as the book is written by doctors, that shouldn't surprise me. All in all, don't freak out when you read it. It does have some handy charts and cheat sheets in it (like rashes/medication/etc.) but all in all, a bit alarmist at times. helpful advice at a time when I felt I was failing as a mother. It reassured me that it is the rare toddler that doesn't throw food, eats all the nutritious food put before him, and indicates his wants/needs verbally! It would be a nice reference book, but definitely not a book to read cover to cover. Loved Baby411 after a pediatrician recommended it the day after I had my daughter. Now that she's one, I had to get the toddler edition. So much good, straight forward information. You don't need an MD to understand this book. Everything from milestones to discipline to shots to rashes. Recommended without hesitation! A great follow-on to Baby 411. I have read this book over and over and refer to it often. It does repeat some of the info from Baby 411 that is still relevant, but adds a lot of new info as well. It seems that every time something changes with my son or a new issue crops up, I find another relevant gem in the book. Since I have a very active toddler, I don't have time to sit down and search through myriads of info in an attempt to find answers a specific problem. 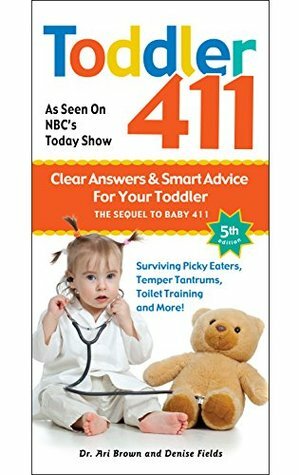 Toddler 411 has a very detailed index that allows me to find the specific topic I'm looking for as well as offering practical solutions without making me overly paranoid the way other books tend to do. The one book I turn to when I need guidance for medical issues and random toddler stuff like making the leap from crib to big kid bed. Whenever I have raised a question during a pediatric visit, it seems as though the Dr or NP's response is exactly what I have read in this book. So much better than all the other toddler advice guides out there.